Panetone: The cherished Italian holiday bread. Jeweled with candied fruits (particularly citrus) and raisins, it first came into being in Milan about 1490 and was quickly adopted throughout Italy, from the Alps to Sicily. Legends abound concerning the origin of panettone. The most popular is one that tells of a young aristocrat smitten with the daughter of a pastry chef named Toni. To impress the father of his beloved, the young man pretended to be an apprentice pastry cook and invented a wonderful sweet dome-shaped bread of exceptional delicacy. This new fruit bread was an enormous success; people streamed into the bakery to buy the exceptional "pan de Toni." In Milan, businessmen adopted the habit of giving panettone as a Christmas gift to their clients. However, for a long time panettone was seen as a luxury accessible only to a select few, until the development of new production techniques made it available to everyone. A process combining natural yeast and a paper mould allows the yeast to leaven the dough to produce a cake that is light as a feather. In Rome, cannon are fired from Castel St. Angelo on Christmas Eve to announce the beginning of the holiday season. A 24-hour fast ends with an elaborate Christmas feast. Small presents are drawn from the Urn of Fate. The main exchange of gifts takes place on January 6, the feast of the Epiphany, the celebration in remembrance of the Magi's visit to the Christ Child. Children anxiously await a visit from La Befana who brings gifts for the good and punishment for the bad. According to legend, the three wise men stopped during their journey and asked an old woman for food and shelter. She refused them and they continued on their way. Within a few hours the woman had a change of heart but the Magi were long gone. La Befana, which means Epiphany, still wonders the earth searching for the Christ Child. She is depicted in various ways: as a fairy queen, a crone, or a witch. A strict fast is observed a day before Christmas and ends 24 hours later with an elaborate celebratory Christmas feast. While the Christmas Eve dinner excludes meat items and is based mainly on fish, it is permissible to eat meat on Christmas Day. Though the menu varies from region to region, the first course of a Christmas feast is either a Lasagna, Cannelloni or a timbale of pasta.Mixed roast or roast beef form the main item for the second course. These are served with various types of cheeses, fruits(dried and otherwise) and lots of sweets, all soaked in a good quality red or white wine. Grappa, Whiskey and other hard liquors are also served during the feast. The Torrone, the most typical of the Christmas sweets, its available with honey or chocolate almonds or pistachios. 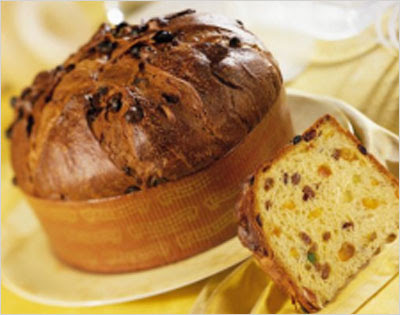 The Christmas cake eaten is of a light Milanese variety known as "Panettone" and contains raisins and candied fruits. Another famous cake is "Pandoro" a soft golden colored variety which originated in Verona. Chocolate also features in the menu. At noon on Christmas Day the pope gives his blessing to crowds gathered in the huge Vatican square.